While more than 100 acres of winter wheat blanketed the spring soil not ten yards forward of our position we felt strangely closed in, but it was nice, even intimate. Nothing means more to a young son sitting in the darkness than knowing he’s next to his dad; I can say the same for sitting next to him. We sat, whispered and giggled for nearly an hour before I noticed a silver hue raining down through the treetops over our shoulders. It was just enough to expose the haunting glow of layered fog as it began to roll back its stranglehold on dew-laden wheat. As minutes ticked away so did darkness. The silver hues succumbed to radiant shades of amber and gold as frigid temperatures dropped several more degrees. My son Jacob said I looked like a bull with “smoke” surging from my nostrils. Like any dad lacking common sense, we were under dressed, but we managed. An hour after sunrise the earth began to warm as our backs were the first to feel the sun’s kiss. This spring turkey hunt was shaping up to be one for the books, kill or not. Jacob receiving turkey-hunting tips from his father. Daybreak had started with soft, subtle yelps as we listened for gobbles on the roost and the familiar sound of birds flying down to begin their morning routine, but by now the birds had grounded and like with so many previous hunts they were not where I wanted them. The hens had flown down across the river and the toms followed. I still felt confident, intense scouting suggesting they would cycle through our area around mid-morning. 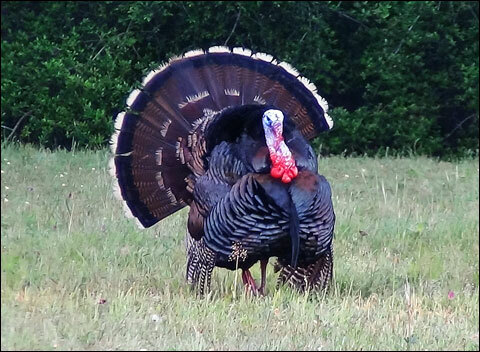 Try as we might, those dang turkeys weren’t cooperating! Mid-morning had come and gone and Plan B was now in force – run and gun. I carried my shotgun, a couple of decoys and nearly everything else to save time while my son followed as best he could carrying only his shotgun and our ThermaCELL unit. As spring turkey hunting goes, mosquitoes are fierce, especially along the river bottom. We made a mad dash along the river some 800 yards away and ducked behind a tree that had fallen during a recent thunderstorm. I slid out and low crawled to a rise just above the riverbank to set up decoys. The ground was hard. Pushing the first decoy stake into the dirt was no easy task; in fact, only an inch or so penetrated the ground before I noticed blood red heads bobbing not more than 60 yards away. There was no time to place another decoy. I slid back into position next to my son and peered back out, scanning the area for advancing birds. To my horror, the decoy began to lean in a slow fall; worse, with only an inch or so of stake in the ground, my hen looked as if she was twice as tall as any normal turkey. Neither problem was going to help us bag a tom! The good news was that the birds continued their approach. The author with his son, Jacob. My son nested the stock of his shotgun in his shoulder and elevated the barrel by raising his knee. Two toms wound their way towards our setup, sidestepping and shifting ever closer; just a few more feet and the hunt would be over. No sooner did I think that when my hen decoy fell over dead. I can’t imagine what went through the minds of those strutting toms, but it didn’t matter, the sudden fall scared them half to death. Every bird in sight took flight and headed back across the river. They were long gone! I could have taken a lesson from my son. While I stewed over the catastrophic failure he laughed out loud. We picked up the decoy and headed back from where we came. Out of ideas, the only thing I knew was that I had scouting images of birds crossing through our original location every day for over two weeks. We hurried back towards our original location where I was sure the turkeys had been partying as a result of our absence. Reaching the corner of the wheat field, we slid back under the cloak of the tree line in stealth mode and continued our advance. The afternoon trek was tough. Long gone was the bone-chilling cold of day break; it had been replaced by 80-degree temperatures made hotter by the stress of trying to navigate through the thicket with some sense of hunting prowess. Try as I might to keep quiet, I found one stick after another to snap underfoot while my lollygagging son walked gingerly in tow, never making a sound. As we neared our original spot I snapped yet another twig. This time the heaving air filled with gobbles. We froze and slowly sank down to one knee. The tall grass obscured my vision some but I could see enough to make out red waddles dancing around in the thicket. As I had imagined, they were on the field’s edge directly in front of the large oak we had camped under hours earlier. I was disgusted. I wanted to laugh but felt too sick to my stomach to do much of anything. Just regaining my composure seemed a tall order. If we had just stayed put my son would have a bird on the ground. I turned to apologize. True to his character, his only response was a simple, comforting smile. He was oblivious to all of it. What he knew was that he was with his dad on some great adventure. Now, more than ever, I wanted my son to get a shot. We slid further back into the woods to circle around. 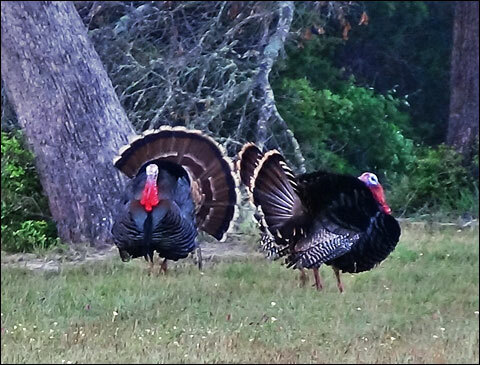 A couple of toms strut into view. Like a couple of spring turkey hunting pros we circled and advanced undetected. We crawled, slithered and crawled again into a position where we could see four strutting toms and a dozen hens milling around at 20 yards. I chuckled to myself when I realized that the large oak we sat under in the darkness was now the only thing of significance between us and them. We slid over to a small rise where the grass was shorter and tucked behind another tree. I helped my son position himself. He lowered the barrel between a split in the trunk as I whispered, “Take the tom on the far right when he raises his head.” He nodded in understanding. “No, son, you missed. It’s okay.” I stammered, searching for the right words to console him while replaying the events in my mind. What explanation could I give a kid who poured his heart… and his sweat into every step we took without so much as an ounce of complaining? As quickly as I began to speak, I stopped. He wasn’t paying attention to me. He was too busy jumping up to grab a low hanging limb that needed bending. He turned towards me and smiled, then looked up at the branch. I knew what he wanted. I walked over and lifted him to the branch. He held tightly and I let him go. We laughed out loud when the branch didn’t bend as quickly as he thought. I left him there, hanging and wriggling, until the branch succumbed and slowly lowered him to the ground. After riding his branch down a few more times we headed back down the tree line towards the truck. He wanted a piggyback ride but I was carrying everything except him; a carry wasn’t happening. The sun made its final stand as we drove towards the gate in a perfect end to a seemingly imperfect day in the spring turkey woods. We didn’t hunt the following day, church and chores ruled the roost, but I did take some time to investigate my son’s miss. My son is quite a shot; in fact, he’s never hit less than a bullseye with a crossbow at 20 yards. He’s not quite as accurate with rifles but he’s pretty consistent with a shotgun. I grabbed his shotgun and headed out behind the house to take a couple of shots. I set a target up at 20 yards, sat down, raised the shotgun and took aim. Even before firing a shot the cause of his miss was immediately evident. I pulled the trigger anyway and hit where I thought I would, a couple of feet to the right, not a single piece of ball shot tore paper. His rear sight had been pushed over considerably, something I should have caught well before the hunt. I talk quite a bit about preparation, practicing year round and knowing your equipment; I even talk about it in hunting seminars but this time I didn’t practice what I preached and it cost my son his first spring turkey. Had I followed my own rule, we would have patterned his shotgun before heading out to make sure our grouping was accurate and effective. 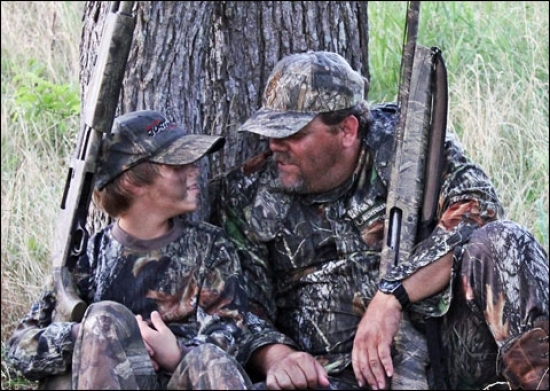 Whether you hunt alone, with a friend, or add to your legacy by dragging your son away from his video games, preparation is critical and patterning ranks among the top concerns. The message here is simply to walk on the rocks I stumbled on during this hunt. Not only is practice and double-checking your equipment important, so is your attitude. On a day where the teaching was mine to be had, my son took over. He reminded me that killing is an insignificant part of hunting, especially on treasured trips like this spring turkey hunt and the others we’ve been able to enjoy together. 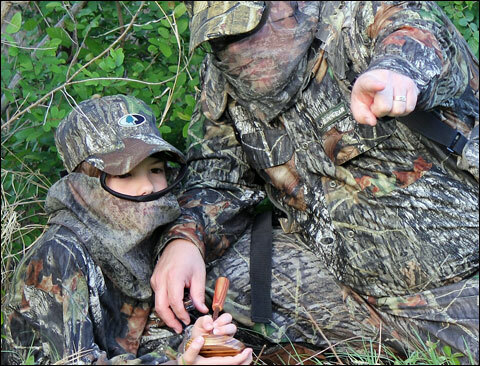 The real rewards are memories, the legacy I continue to build for my son and the one I help him build in the woods. The truth is, we both walked out with much more than we carried in. and Rocky Mountain Elk Foundation. Kevin Reese resides near Corsicana, Texas with his wife, Kelly and 11-year-old son, Jacob and is an award-winning outdoor writer, photographer, videographer, seminar instructor and public speaker. He also hosts Global Outfitters TV Show’s GO Tips. Kevin enjoys duck, dove, turkey, deer, hog, elk and predator hunting with shotguns, rifles and bows. He loves to spend time on the water bowfishing or fishing. Kevin also handles outdoor industry clients for The Media Group, a successful public relations (PR) agency based in Illinois and serves on the Professional Outdoor Media Association (POMA) Board of Directors. In addition, he is a member of the Texas Outdoor Writers Association, National Rifle Association, National Shooting Sports Foundation and Rocky Mountain Elk Foundation.